From now on I will be solely focusing on the expression ‘Being able to live to the end of a human life of normal length’ and assume that the semicolons are meant to introduce separate thoughts within the same capability listed. Please see reasons for in note  below. It also seems to be that although talking about the length of life seems fundamental, it also seems to be disconnected from other issues, maybe because it is such a fundamental, 0-level assumption, everybody can accept with much further thought? Well, philosophy excels in examining underlying assumptions under a critical light, so this is what we are going to do. To my regret I was not able to find a study that is reflecting on this first capability and its formulation at length, and am open to any suggestions on part of the readers to help me find relevant texts. 49. Although “normaL length” is clearly relative to current human possibilities and may need, for practical purposes, to be to some extent relativized to local conditions, it seems important to think of it—at least at a given time in history—in universal and comparative terms, as the Human Development Report does, to give rise to complaint in a country that has done well with some indicators of life quality but badly on life expectancy. The main point here is that Nussbaum seems to connect the concept ‘Being able to live to the end of a human life of normal length’ to the statistical, descriptive concept of ‘life expectancy.’ This serves us to develop the first argument showing the problem with this concept within the capability approach. Nussbaum connects this concept to statistical life expectancy, so how is ‘life expectancy’ defined? Well, in different ways, but in a quantitatively, statistically, computationally meaningful way. Whether it is life expectancy at a given age, or life expectancy at birth (LEB) and whether it is mean length of life of an actual birth cohort (cohort LEB, individuals born a given year) or mean length of a ‘hypothetical cohort assumed to be exposed, from birth through death, to the mortality rates observed at a given year’ (period LEB), life expectancy is defined with the mathematical concept of ‘mean’. And this is bad news for Nussbaum’s concept when ‘normal’ is interpreted with ‘average’ as ‘mean’ in mind: Even if average life expectancy works, ‘end’ cannot work as 50% of people will die before average life expectancy so definitely not making it ‘to the end’ in any meaningful way. With the capabilities approach the point is for societies to guarantee these fundamental entitlements for all its citizens to have a life with dignity. 50% is a good number but it’s 50% away from all. But maybe statistics plays a game with us, and the switch between individual and population based viewpoints can explain away the issue at hand? Individually speaking, so from the point of view of every individual it is true that all individuals born have a chance to live till the end of normal life length, meant as average life expectancy. So far so good. But the way the concept of average life expectancy defined makes still 50% of them has actually 0% chance to do so. If we look into other capabilities on the list we don’t see this problem, except potentially 2. Bodily health, see note  below: think of #9 Play. Being able to laugh, to play, to enjoy recreational activities or #6. Practical Reason. Being able to form a conception of the good and to engage in critical reflection about the planning of one’s life or #5. Emotions. Being able to have attachments to things and people outside … do I really have to continue? Problem 1: If ‘normal’ in ‘the end of a human life of normal length’ meant statistically and descriptively as ‘average’ then the concept only covers ~50% of people. Let’s try to look for a statistical concept that might serve as a substitute for ‘normal’ in ‘the end of a human life of normal length’ instead of life expectancy. What if ‘normal’ means ‘typical’? ‘Typical’ as in something very common, hence almost representative or characteristic. Here we have an alternative statistical concept that focuses on the ‘typical’, most common age where most deaths occur and it is the ‘modal age of death’. Modal stands for mode, a statistic referring to the value that appears most often in the data under study. My main reference here is The modal age at death and the shifting mortality hypothesis by Vladimir Canudas-Romo. 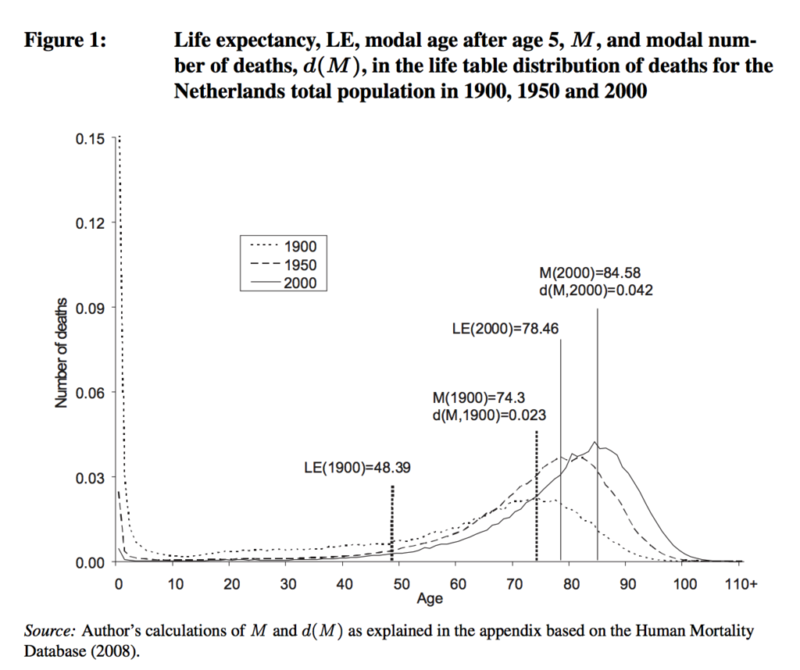 Let me copy here Figure 1 that shows calculated modal number of deaths from the Netherlands in 3 time points: 1900, 1950, 2000. While the jump in life expectancy is huge from 1900 to 2000 (48yo -> 78yo), the increase in modal age of death is more moderate (74yo -> 85%). But my main point here is that in 2000 the modal number of deaths accounted for 4.2% of all deaths. And looking into the difference between life expectancy and modal age of death it seems obvious that modal age of death is an even worse candidate currently than average life expectancy understood as ‘normal’ in the term ‘to the end of a human life of normal length’, since it accounts for much less than 50% of all deaths. Now this might change in low mortality countries, but currently seems just not applicable when formulating a fundamental capability that should be granted to individuals by society in terms of the length of their lives. Problem 2: if ‘normal’ in ‘the end of a human life of normal length’ meant statistically and descriptively as ‘typical’ then the concept only applies to a minority. I will continue with other, less statistical suggestions on how to possibly interpret ‘normal’ before phrasing other arguments. Semicolons are used in the second capability to separate clearly distinct ideas: 2. Bodily Health. Being able to have good health, including reproductive health; to be adequately nourished; to have adequate shelter. Dying prematurely is usually understood as dying young. This might mean young adult mortality but more probably this concept aims at infant and childhood mortality. I both recommendation are a very obvious thought, non-negotiable, so ‘dying prematurely’ can cover both. Economical reason: Why would Nussbaum express the same idea in 3 different ways, so abundantly?